This entry was posted in MQGem tools, QLOAD and tagged IBM MQ, IBM WebSphere MQ, MQ, MQ Appliance, queue manager, tools, WebSphere MQ by mqgem. Bookmark the permalink. Very useful feature. There is a “qload” integrated in MO71. Will this feature be available also through MO71? The QLOAD feature in MO71 is a very basic version. 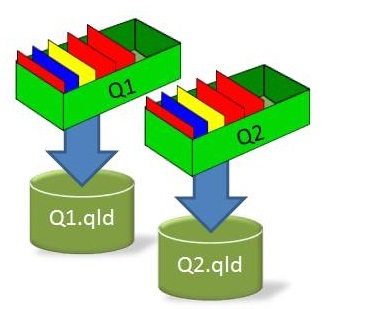 There are a number of features in QLOAD that are not part of MO71. Some features of QLOAD lend themselves better to a command line tool, and this is one of those. So it will not be added to MO71. Very informative. I have a question. This approach is similar to take the objects backup from old machine and create a queue manager at another machine then execute the objects. Why can not we stop the queue manager gracefully at old machine, then take the queue manager directory backup then move to the new machine and start the queue manager. I do feel this approach also can be considerable and well tested approach. Please suggest me. If you have already have a mechanism for migrating your messages from one Queue Manager to another then that’s great, continue to use it if you wish. We have looked for the official description from IBM on how to do this but can’t find it, Do you have a link you can share ? Our belief is that there are limitations with the directory approach. For example, I wouldn’t want to use it if I was moving the type of server, for example migrating from Linux to Windows or AS/400. It is also a bit all or nothing – you wouldn’t want to restore all SYSTEM queues for example. The QLOAD approach also has the advantage that each queue’s messages are safely stored away in a separate file which you can restore at any time, on any queue manager, if something goes wrong further down the line. You are right(Your approach is 100% recommended). Apparently, playing with messages is little tedious. As you told, we have option with offload messages from queues to a file then restore to new queue managers. I was referring approach for persistence messages and at the same level of operating system. In this case, if we stop the queue managers then the move the working directory to new server, I hope it should work(as messages will be retained during QMGR restart). in case of different operating systems/other concerns, we don’t have option. I have one question. Suppose if I move messages to a file from windows queue manager and recreated a queue manager in AS/400 or other in operating system, if i try to reload the messages from file to a queue, will I get any CCSID problems or any message conversion issues? When saving messages using QLOAD, the whole MQMD is also saved which naturally includes the CCSID and Encoding. When restoring the messages from a QLOAD file they are restored with the same CCSID and Encoding, therefore the contents of the message are still correctly represented by the CCSID and Encoding. So long as your applications use MQGMO_CONVERT, all will be well (even moving from an ASCII Little Endian machine to an EBCDIC Big Endian machine). If however, your applications don’t use MQGMO_CONVERT, and expect the messages that they get to be in the correct CCSID and Encoding already, you can use QLOAD to convert them accordingly when you unload them so that when you load them onto the target system they are already converted. You use the ‑c parameter for this.